Medication certainly has its benefits in headache management for kids but for some, various therapies and techniques can complement or in some cases, even replace medication. The risks and side effects of medication mean that it is often preferable to find alternative ways of coping. Headache pain can be difficult for children, especially when it strikes during school hours or while at play. Prevention is usually the first strategy but when headaches do attack, easing headache pain without medication may be a primary goal. Dehydration, particularly when it's chronic, can trigger headaches in children. 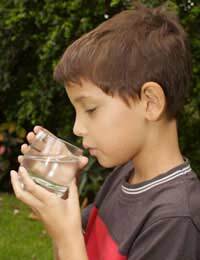 The obvious solution is to ensure that your child stays hydrated and consistently drinks fluids. If a headache does strike, however, sipping water may alleviate pain if the headache is due to dehydration. Some kids will also find that a glass of icy water helps to slightly soothe hot throbbing head pain. Low blood sugar is a known trigger of headaches and if your child has unfortunately missed a meal or perhaps participated in extra intense physical activity such as sports, his or her resulting low blood sugar may have prompted a headache. Eating a small balanced meal with protein, complex carbohydrates, fat and fibre can help to stabilise blood sugar. Easy and nutritious examples of snack foods to keep on hand for when headaches hit are a tuna sandwich on multi-grain bread, or cheese and crackers. If intense nausea is present with the headache, foods such as whole wheat toast or oatmeal are simple, less likely to exacerbate nausea and effective in raising blood sugar levels and helping any correlating headache pain. For instant headache relief, the three d's of headaches can be helpful: dark room, damp cold cloth and 'do not disturb.' If your child is at home, tucking him or her into bed, turning off the lights and placing a damp, cool cloth on your child's head can temporarily soothe headache pain. Keeping the surrounding area quiet and not disturbing your child can also be helpful, as noise can intensify a painful headache and more so if it's a migraine headache. As with most lifestyle factors, it's ideal to consistently maintain changes so that you prevent headaches from happening. If your child is dealing with a particularly stressful situation such as an exam, however, strategies such as deep breathing exercises can provide immediate headache relief. Work with your child to help him or her learn to focus on breathing. Slow, deep breaths in and out can be calming and can help to take the focus off a distressing situation. Kids can be quite open to learning new things and when it helps their headaches, it's even more beneficial. Relaxation techniques such as deep breathing, imagery and positive affirmations can increase your child's confidence and help to prevent and treat headaches when they strike. Relaxation techniques can give kids a stronger feeling of control of their head pain. Affirmations are a way to replace negative statements with positive ones. The stress of dealing with headaches can leave kids feeling very badly about themselves and encouraging kids to take control helps them to understand and cope with head pain. Medication may be required but do try to work with your child to develop alternative coping strategies.